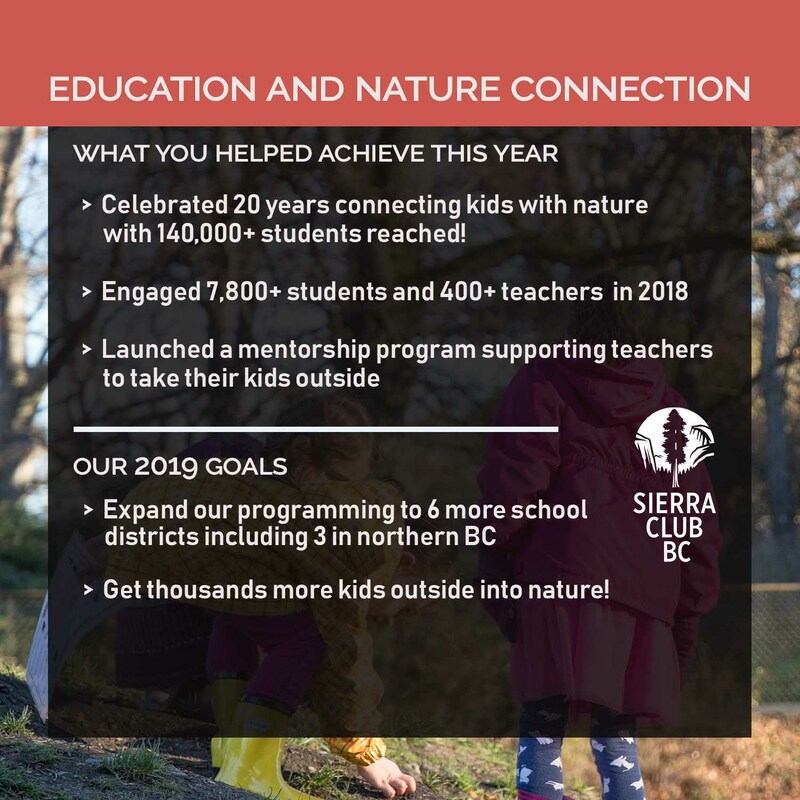 Working for Sierra Club BC as an environmental educator, I’ve had the opportunity to travel and spend time in many different communities across BC. Something I’ve noticed just about everywhere I visit is that people in the community have something in common: they’re all looking to find ways to interact and feel a sense of belonging in their own community and connect with nature. Kids in particular are needing to create that sense of belonging in order to feel like they have the support to build relationships with the places they’re in. Relationship with other people as well as all the other living beings such as the plants and animals that live there too. They’re seeking support and acceptance from their families and friends. And in a different way, they are needing support from elders and other adults in their community, who could be referred to as community aunties and uncles. 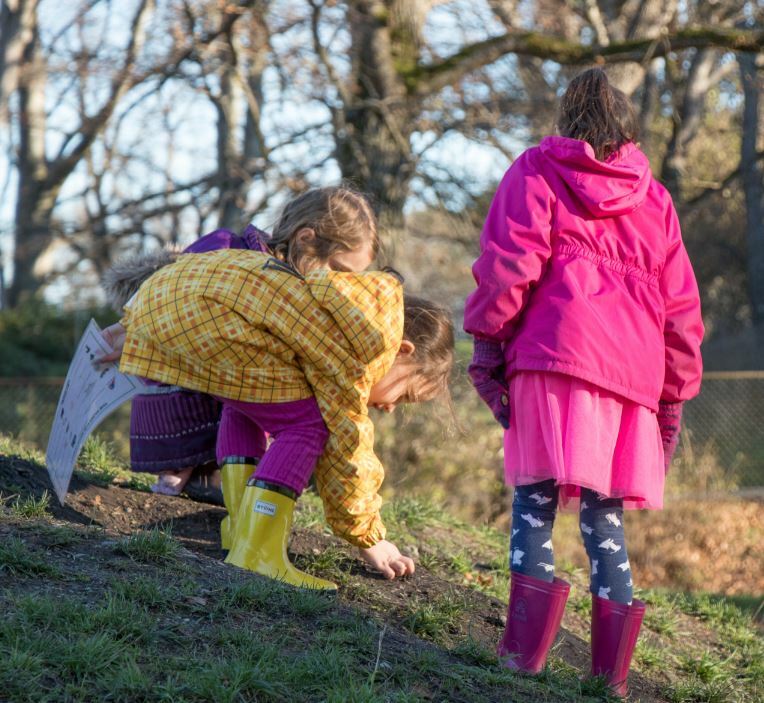 This brings me to something I’ve been wondering about: how do we raise kids in nature-focused community? 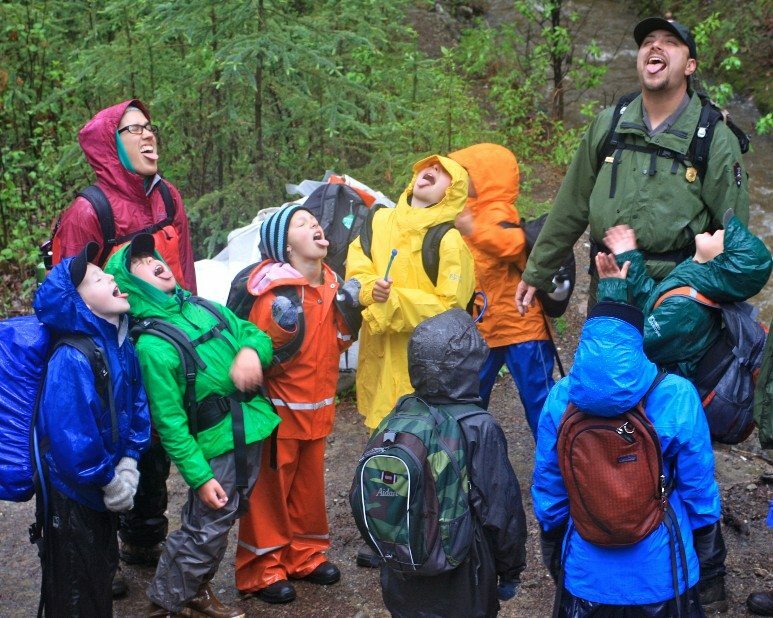 You can get kids in your community outside in all kinds of weather! The importance of nature in a community is essential to create value for nature in a child’s life. If you live in a place where nature is valued by community members and thought of as essential for their well-being, are you more likely to ensure you’re collectively taking good care of it? Communities play an important role in how they model the value held in protecting nature for future generations who come to live in those places. When I travel to small and large communities here in BC, a common response parents give about why they moved there has to do with nature. They say they live in a certain place because of the close proximity they have with wild spaces, and they want that for their children. This gives me hope that if people truly value what nature can provide to communities and children, then maybe we will have a chance to see more communities come together to develop something sustainable for our children and future generations. 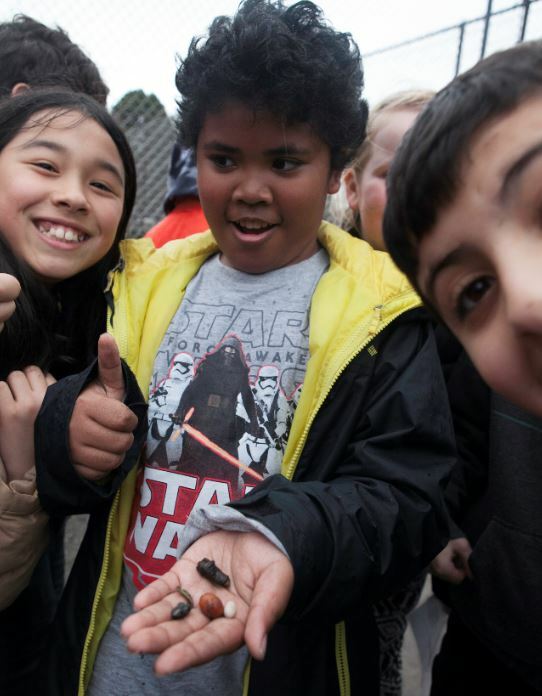 We have the capacity to build communities that are rich in nature play spaces, protection of local species, outdoor environmental education programs embedded into the education of our children. Nature play time provides a place for being with friends, parents, elders, aunties and uncles from the community. It also provides a place for nature to be part of a child’s development. The benefits of spending time outside include decreased anxiety and depression, improved mood, increased flexibility and even improved vision. This winter, I encourage you to go out for a nature scavenger hunt or play a nature-based game. A great game I play with students is the webbing game. It teaches kids about the delicate balance and intricate dependency that all living things have with one another. The game becomes more challenging when there is something missing from part of the ecosystem. For example, if the salmon population is decreasing in a community because of overfishing, then the population of bears and trees and plants in the forest are drastically impacted. Playing this game challenges kids to ask the difficult question, how is my community part of protecting nature for my lifetime and the future generations to come? It also reminds us that we all have a role to play to keep the web within our community from falling apart. Kirsten ready to teach. Photo by Amira Maddison. 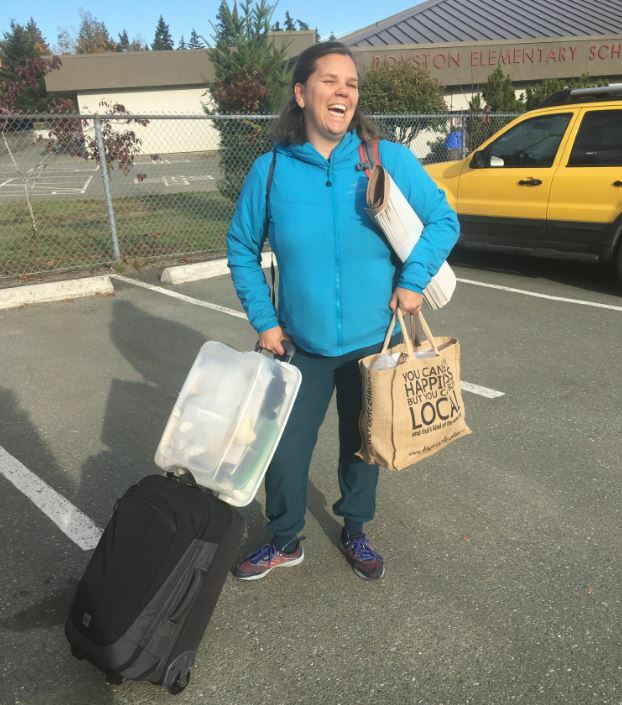 This fall, Kirsten and I had the mission of hitting the road on two separate trips to teach across Vancouver Island. We had the pleasure of visiting School Districts 68, 69, 71, 72, 84 and 85 and working with new schools, students, and teachers. Our first trip in October led us to beautiful Kwakwaka’wakw, K’ómoks, Homalco, Klahoose, and Tla’amin Nation (Sliammon) territories. 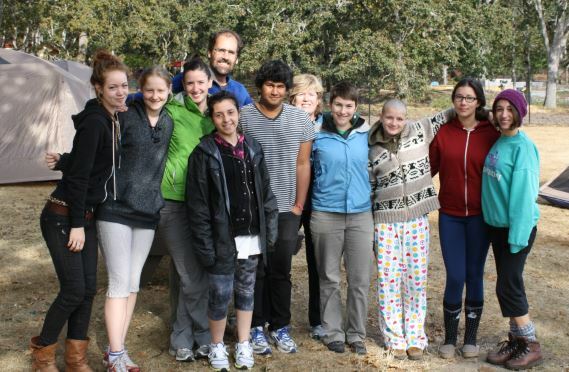 We set off from Victoria and went as far north as Campbell River and Quadra Island. To the W̱SÁNEĆ people, October is the month of PEKELÁNEW̱ – “The Moon That Turns the Leaves White.” This moon marks the end of summer and the beginning of cooler weather. For the gardeners in the crowd, it brings the first fall frost. Fortunately for Kirsten and I, we were greeted by bright blue clear skies and sunshine bright enough to warrant packing shorts for the trip, and affectionately being able to call the month Aug-tober. 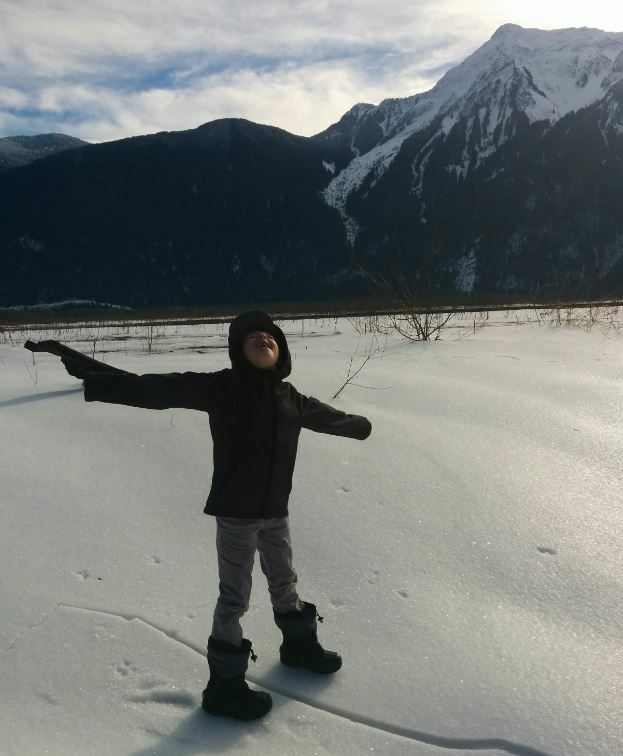 Although I’m a firm believer that place-based education can be done in any setting, central and northern Vancouver Island’s raw beauty helped create an ideal learning environment. 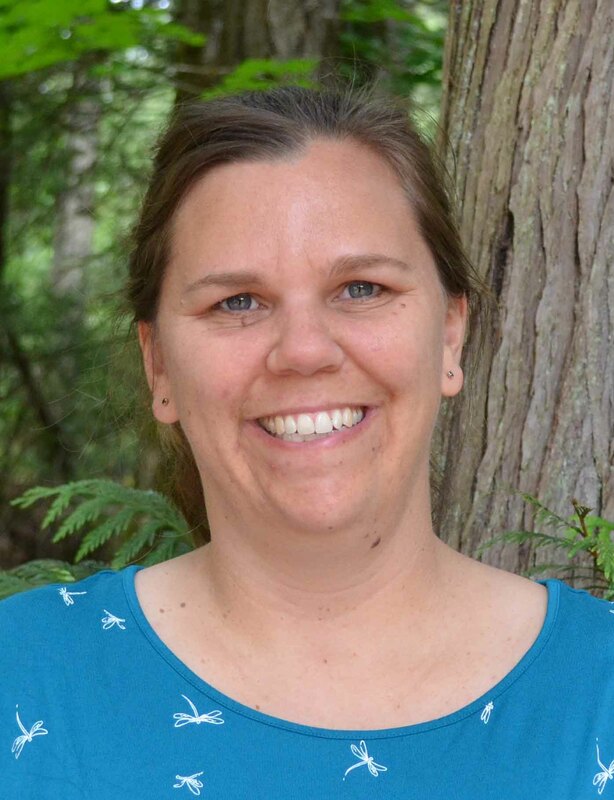 To be talking about ecosystems in a classroom immediately followed by seeing producers and decomposers in the forest behind the school is an excellent reinforcement for learning, and helps create a connection to that place. 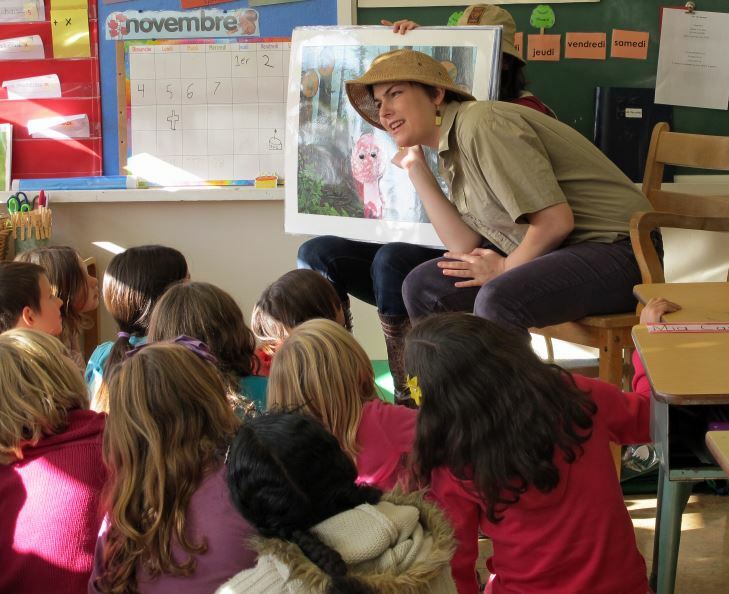 On Quadra Island we had the opportunity to teach every class in the small elementary school, tying our programs directly into a strip of second-growth forest directly behind the school. Not only were we able to inform the youth of the island, but we were also able to team up with Jens Wieting, Sierra Club BC’s Senior Forest And Climate Campaigner, and Sierra Club BC’s Quadra Island Local Group for a night about the state of the forest, possible solutions, and how to help save BC’s endangered rainforest. 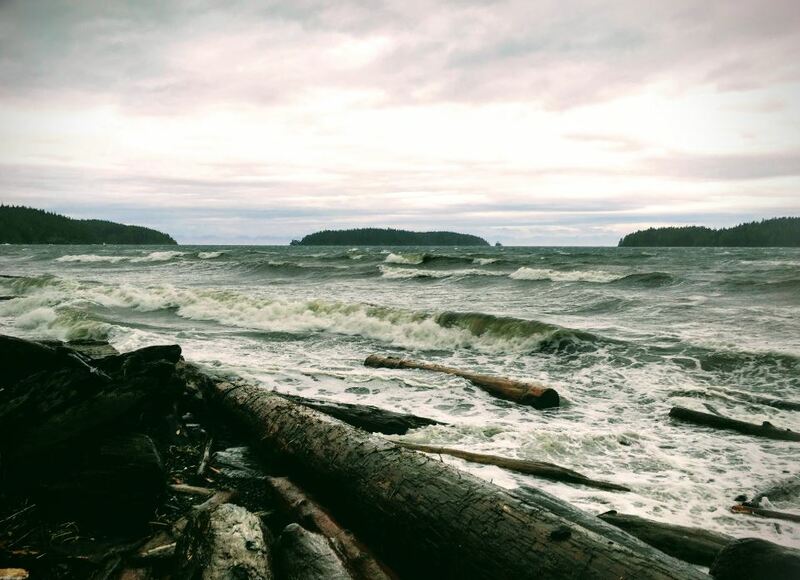 Weather warnings on Eastern Vancouver Island. Photo by Amira Maddison. Our second trip took place at the end of November and took us to Snuneymuxw, Homalco, K’ómoks, Te’mexw, Tla’amin Nation (Sliammon), ‘na̱mǥis, Kwakwaka’wakw, Quatsino, and Nuu-chah-nulth territories. We set off teaching our way north to Port Hardy, making detours along the way to islands and western Vancouver Island communities. To the W̱SÁNEĆ people November is the month of SJELCASEN – “The Moon of Putting Your Paddle Away in the Bush.” As we travelled north to Port Hardy, we quickly learned why. This moon is the season of strong winds. The weather is unpredictable and brings rough seas. We Sierra Club BC educators aren’t afraid of a little bad weather – or in this case a wind, waves, and rain warning from Environment Canada. We suited up with rain jackets ready to facilitate our programs outside in any weather. To our amazement, students were enthusiastic about joining us for a program regardless of the conditions. The weather held out long enough for Kirsten and I to catch ferries to t̕łat̕ła̱sk̓udis (Sointula) and ‘ya̱lis (Alert Bay) respectively to reach communities across Broughton Strait. ‘ya̱lis has a thriving ‘na̱mǥis community with a vibrant culture where the elementary school students learn Kwak’wala. School love! Photo by Amira Maddison. Once we made it to Port Hardy, we switched gears. Here we would be leading a workshop for the school district’s Professional Development Day. Our half-day session had teachers in attendance who taught from Kindergarten up to Grade Twelve, and we were providing information to better incorporate place-based learning into their teaching routines. What a pleasure it was to take this group of educators to a local stream and talk about activities to tie in with different areas of the BC curriculum. 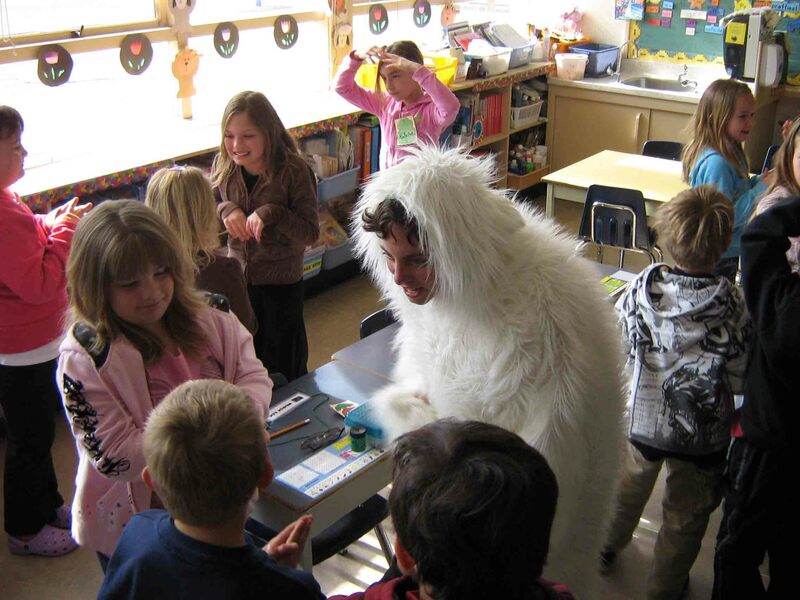 Port Hardy also gave us extra time with the students at the elementary school. Kirsten and I helped facilitate, but more importantly got to participate in the school’s after-hours Ecoart club. We were inspired by the local river system and the natural items – from plants to bones – that Kirsten and I have in our teaching supplies to create multimedia works of art. As we made our way back down the island, I reflected on all the communities we had been to. Every child that grows up on Vancouver Island lives on the territory of an Indigenous nation. 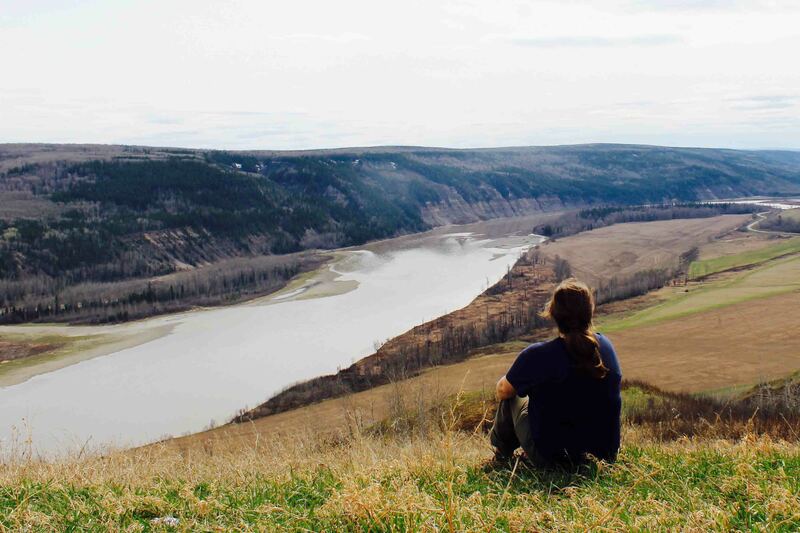 I hope that our education programs are able to plant the seed of connection with this land, but also of inclusivity with those we share it with. I’m very thankful for the experiences I’ve had and all the students and staff that have helped make our programs a success. Please donate today to help get more kids outside in 2019. Feature image: Humpback spouts seen from Quadra Island. Photo by Jens Wieting. 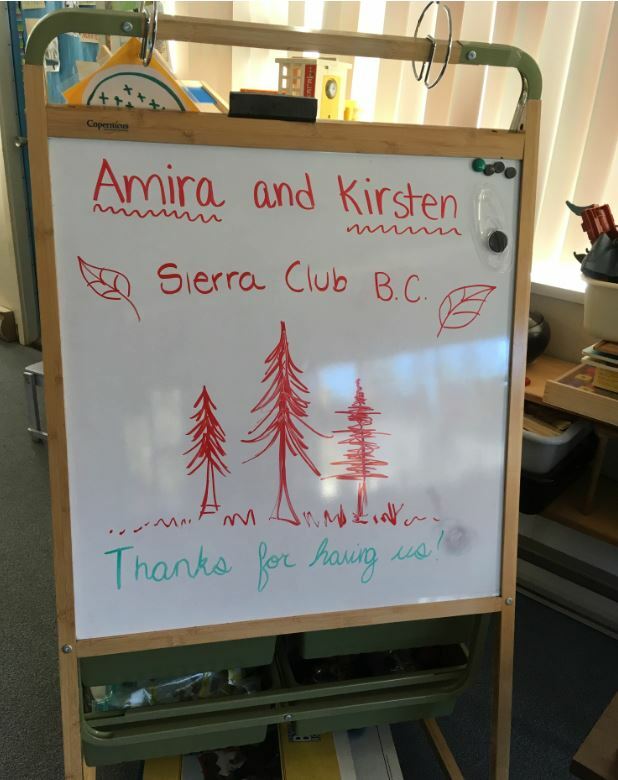 At Sierra Club BC, we love science! To mark Science Literacy Week, the Sierra Club BC Education Team has come up with a list of our favourite nature science books for students, teachers and learners of all ages. Check it out and share with fellow science lovers!